For some reason, I forgot all about these little desserts…until recently when I saw them posted on Facebook. The second I saw them, the memories flashed back in my head of being a kid and shoving as many of these things into my mouth that I could get. Although my family worships peanut butter (literally…my brother has two dogs named Peanut and Butter), we didn’t make these, so it was a special treat when they showed up somewhere for dessert. The process of making these is similar to making Oreo Truffles, but these are actually easier to make. Partly because the dipping process is faster, since the tops are open. Using a toothpick also makes the process ten times easier, but since I wasn’t a big fan of the little toothpick hole in the top, I just let the peanut butter center soften slightly, then smoothed over the top to get rid of the little toothpick hole. These were magnificent. I usually try to take some sort of dessert to culinary school every couple of weeks for my classmates to indulge in, so these definitely made the list. A girl in my class has Celiac Disease, so she’s missed out on several desserts that have come in because of their gluten content, and I feel guilty every single time. So, when I showed up with these in my hand, I waved to her, smiled and said, “These are gluten-free!” Not really sure if it’s a good thing or a bad thing that there are literally about 80 of these things in one batch. They make a wonderful dessert finger food for gatherings…but watch out, because they’ll disappear quickly! Beat butter and peanut butter in large bowl at medium speed with electric mixer until blended. Gradually add powdered sugar, beating until well-blended. Using a mini cookie scoop, scoop out mixture one by one onto parchment lined cookie sheet. Place in refrigerator to harden, about 30 minutes. Melt chocolate bark in 30 second intervals in microwave, stirring in between each interval until completely melted. 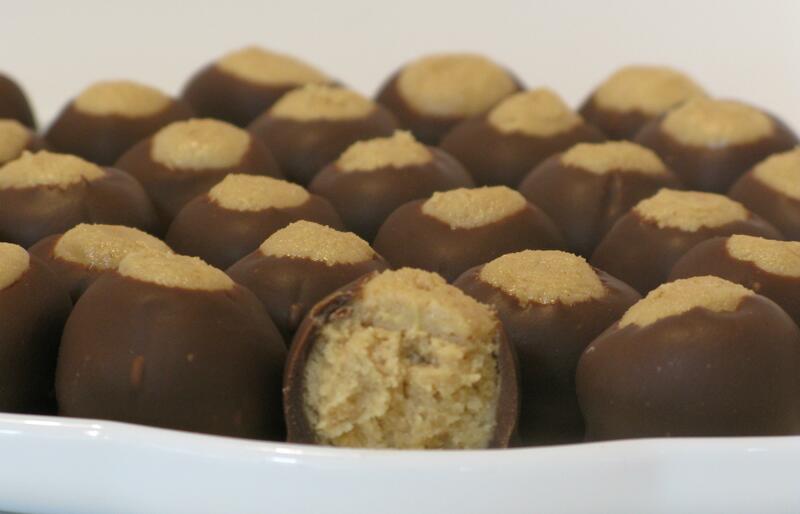 Using a tooth pick or wooden skewer, dip each ball into chocolate–coating 3/4 of the ball. Place on wax or parchment paper, uncoated side up. Let stand until chocolate sets up. Store in airtight container at room temperature or in refrigerator.